The last episode of Friends. David Beckham’s final game. Zayn Malik’s departure from One Direction. Ummm… maybe not the last one, actually. Nevertheless, humans, as a species, are creatures of habit who have a tendency to avoid change. We take comfort in the familiar, and enjoy our day-to-day routines. When something suddenly ends, no matter how seemingly trivial, there’s a certain sense of mourning. During the dire times of the 1980s and (part of) the 1990s, distillery closures were treated almost like an ailing pet dog, whose final trip to the vet would see them peacefully pass on to the great big kennel in the sky. The good times were wistfully recalled, with stories from bygone years retold again and again, but everything had an unmistakeable undertone of ‘they’re in a better place now’. The same could be said of silent distilleries, who were consigned to the annals of history during these dark times. Perhaps it is only now that the Scotch whisky industry is riding the crest of a wave founded on unprecedented global demand, that these recently closed distilleries are beginning to be mourned. The DCL closures of the mid 1980s have been widely lamented, and the loss of Rosebank and Littlemill from the Lowland distillery roster in the 1990s have also been well documented. However, the mothballing (1998), closure (2000), and subsequent demolition (2013) of Imperial distillery in Speyside passed largely unnoticed by those who wept over the loss of Brora, Rosebank, and Port Ellen a decade or more before. Imperial was established in 1897 by Thomas Mackenzie, who at that time co-owned Talisker and Dailuaine. It opened in 1898 to coincide with Queen Victoria’s Diamond Jubilee, and is thus one of the few distilleries to take its name from something non-geographical (a distillery’s water source, or a nearby mountain/village as is typical). It originally had a large gilt crown on the top of the kiln although this was removed (stolen?) sometime in the 1950s/60s and its whereabouts are still unknown. Imperial closed just one year after opening as a result of the infamous Pattison Crisis, an episode which severely affected the industry. It reopened in 1919 but closed again in 1925, the same year as DCL took full control. It remained closed, but was rebuilt and reopened in 1955, producing spirit mainly for blending. It closed again briefly in the mid-late 1980s, reflecting the global downturn in demand for Scotch whisky at that time, only to cease production for good in early 1998. After being formally closed in 2000 by then-owners Allied Distillers (later Allied Domecq), the remaining buildings were demolished by current owners Pernod Ricard to make way for a brand new distillery: Dalmunach. 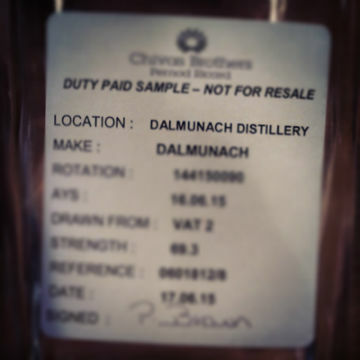 And so my rambling thus far has now, eventually, taken me to the point of this article; an insight into the new £25M Dalmunach distillery. 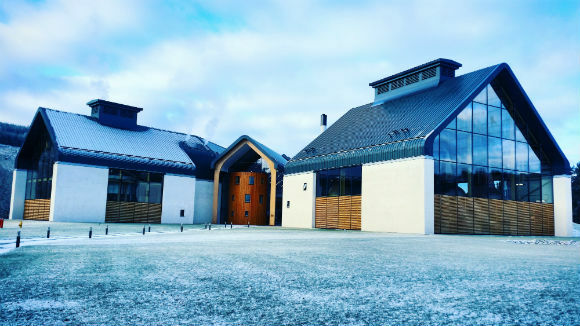 I was extremely fortunate to have been given a tour of Dalmunach by Trevor Buckley, distillery manager, when in Speyside a couple of weeks ago whilst judging the first round of the Spirit of Speyside Whisky Festival Awards. From the outset, the distillery is as imposing as it is impressive. It uses a whopping 480 tons of malted barley each week with the wort undergoing a 54 hour fermentation in one of the 16 stainless steel washbacks. The wash is twice distilled in 30,000 litre wash and spirit stills, some of the largest in the industry. These stills are arranged in a unique circular arrangement, to give the ultimate wow factor. The still shape is identical to those used as Imperial, but double the size, giving rise to an annual production of 10 million litres. Parts of Imperial remain, however, with a wall from the original mill building being incorporated into the building’s internal infrastructure, and parts of the old wooden washbacks being used in the main entrance façade. Having been up and running since 2014, I had the chance to try the new make, and what a complex beast it already is. Tropically fruity – banana, coconut, pineapple and lemon – with underlying notes of caramel and creamy butterscotch. I look forward to seeing what happens over the course of several years of maturation. 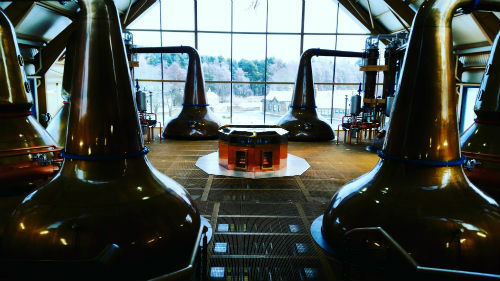 The entire project was overseen by Douglas Cruickshank, who stepped back from his role as Production Director at Chivas Bros in order to focus solely on the new distillery. It’s somewhat fitting that Douglas first began his career in the whisky industry at the age of 15, working at Imperial. Many years later, his final hurrah is to help secure future stocks of malt whisky for the Chivas Bros portfolio, both for their blended whisky brands and, perhaps eventually, as an addition to their single malt range. With Dalmunach being his parting gift upon retirement at the end of a distinguished career, this isn’t a symbolic Testimonial Match, final stadium tour, or tearful last TV sitcom episode. It is a celebration of 21st century distilling. This entry was posted	on Wednesday, February 17th, 2016 at 2:41 am	and is filed under Featured, News. You can follow any responses to this entry through the RSS 2.0 feed. Responses are currently closed, but you can trackback from your own site.